It’s been a tough few weeks recently with the miserable weather conditions and the water clarity of mud it’s all too easy to go a bit stir crazy stuck in the house. So let me try and bring some knowledge and inspiration to you from my new friend and LRF fishing expert Age Lundstrom. Age is a seasoned angler who likes to keep his cards close to his chest but I have persuaded him to give us some insight into his world of LRF and light lure fishing, where it’s not unusual for him to land 10+ pollock as well as half a dozen Bass along with various other mini species. So, here we are experiencing the warmest Winter I can remember. Unfortunately, along with lower heating bills comes murky water conditions, heavy rain and strong winds making fishing tricky, especially for us of a light lure and LRF persuasion. In the Winter months, we seem to use an awful lot of Isome and Gulp in the hope that the scent trail will overcome the murk – to an extent, this works – I’m still catching regularly on both. Recently, however, I decided to start using my small SPs more just to see how effective they can be under these conditions. I’m slowly working through my collection and recording some (albeit rather subjective) results. I am collating these results by repeated fishing the same location under similar conditions and using Gulp or Isome as base level assessment of fish activity on each occasion to try to even out the variability we all experience on different sessions. I hope my findings are of use to someone out there – remember, your experience may differ. Savage Gear mini sand eel – these have been brilliant for small and medium pollock – particularly the paddle tail in sparkly or light colours. Once the water became heavily coloured the success rate plummeted, though. HTO Mini Shad – has caught steadily through out the year ….. wrasse and bass in the Summer, and bass and pollock now. Better in the Marguerita and Ayu colour ways. 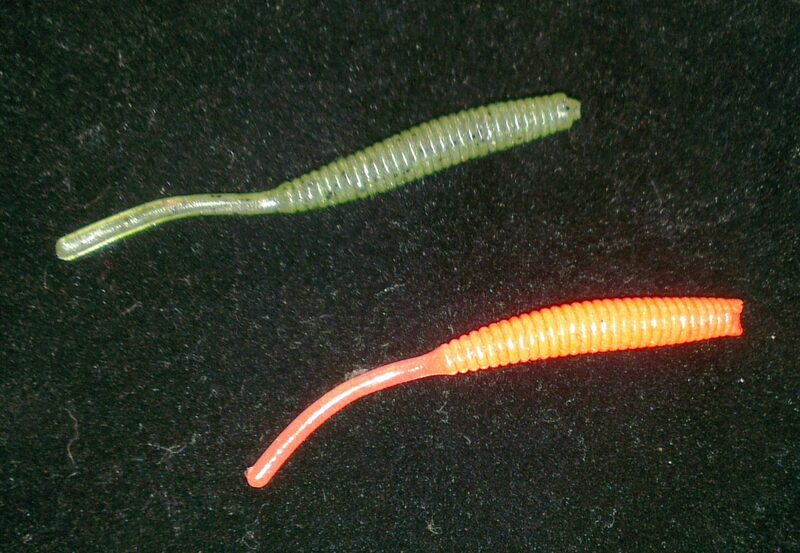 HTO Knight Worms – great all rounder pollock, mackerel, scad and herring all falling to this lure from last Autumn. In the murky conditions under lights, one would expect the darker colours to reign supreme, but this hasn’t been the case, strangely, white has been the best so far this Winter . Eco Gear Paramax – A slightly more disappointing result with this one. Despite being awesome on the wrasse last Summer, the darker colourways are being pretty much left alone, had one take on the pearl and a handful of pollock on the silver glitter version (that having been said, the silver sparkly one picked up the fish when neither Gulp or Isome were getting a touch). 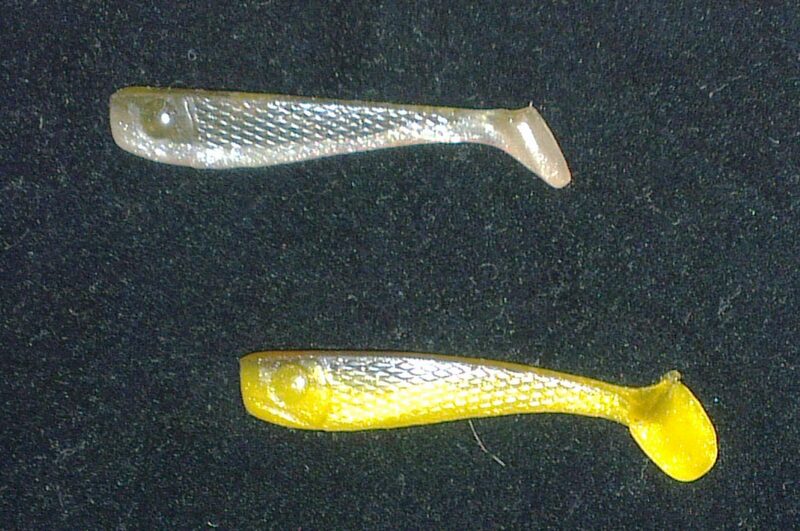 Eco Gear Grass Minnow – again, not the greatest of lures at present. 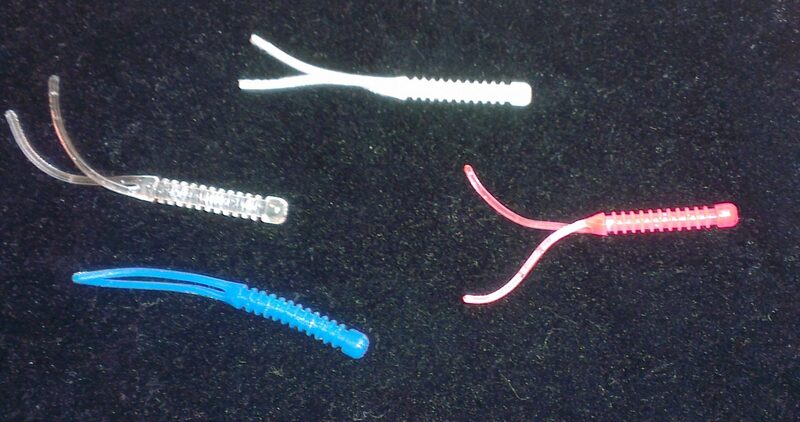 In pink, it still accounts for a few scad and one or two pollock and bass. Rock & Street M-Minnow – The first of my pleasant surprises. These come in several colourways, I selected the dark blue/pearl version. This paddle-tail has really earned its’ place in the box. Each time I have tried it, it has matched the Gulp/Isome on catch rate, yet returned a better stamp of fish. Not that species specific, either having accounted for pollock, scad, bass, herring …. and even a very surprised looking whiting. I have a black/silver sparkly copy which I shall be trying soon ….. hoping for good things, again. 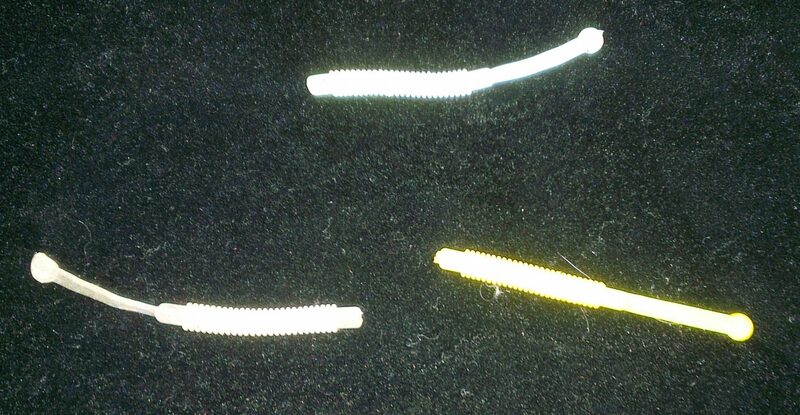 Mister Twister 2″ curly tail – just received a pack of these in black/pearl/chartreuse …. tried them out yesterday and immediate success with the pollock under the lights – selecting out the better specimens, yet again. 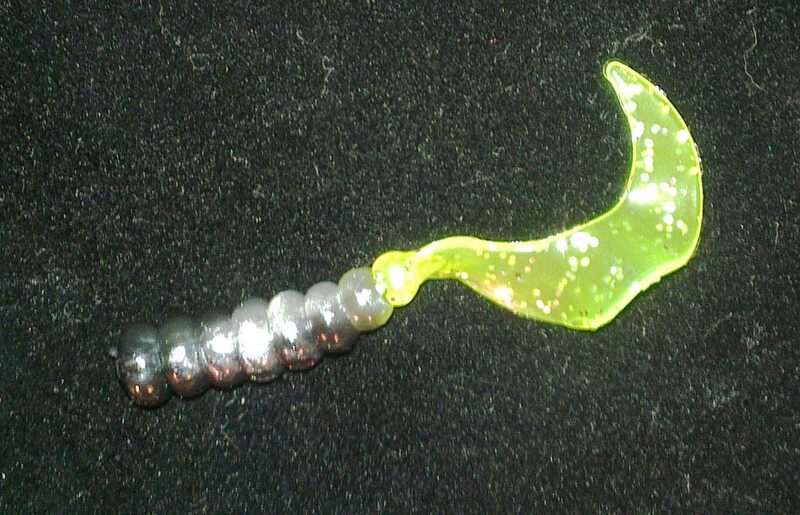 I’ll spend a bit more time on this lure, but initial impressions are that it is a winner. I must have hundreds of lures I have yet to try whilst the water conditions remain reasonably stable. Fishing Tails > All Articles > Tips > Lure > Which Lure Next? 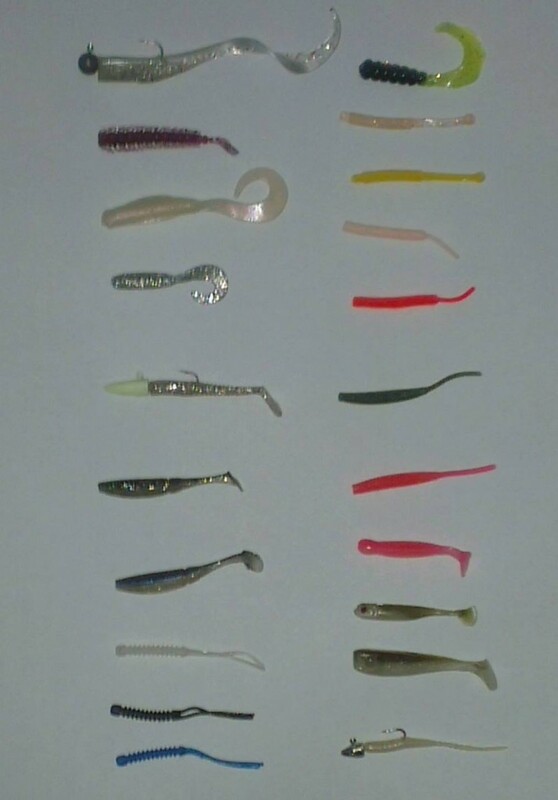 One Response to "Which Lure Next?"